PGI MD/MS exam is scheduled to be held on 25th November 2018 and you are hardly left with 3-4 days to wrap up your preparation. At this time some candidates might be nervous, some bewildered, some anxious. It is not easy for them to concentrate for long hours, but if you aspire to reach your targets, putting in the necessary hard work in these crucial days is very important. So, in order to guide the PGI aspirants in the right direction, we approached Dr. Gobind Rai Garg to share some tips for the upcoming PGI MD/MS Entrance Exam. 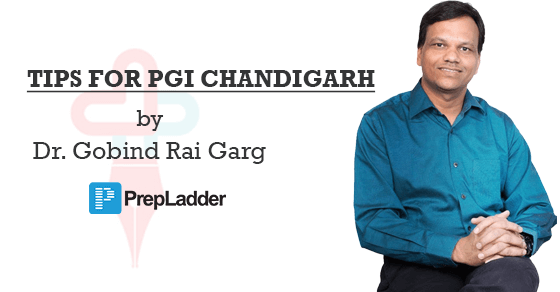 Dr. Garg has wonderfully explained the attempt strategy for PGI exam. PGI MD/MS exam has 250 questions and every question has 5 options and every option is considered as a question in itself. So, your marks will be nearly 45%, which are very less. Instead of thinking that the wrong option should not be marked, whenever you have slightest chances of the option to be correct, the answer should be marked. Even if you have 25-30% chances that the option can be correct, go for it. Go and give your best shot. Remember, life doesn’t give many chances. Make it count. You are a fighter. No matter what, you should never give up your dreams. No need to panic, trust your preparations and abilities. You have really worked hard and will surely be able to grab your dream seat. Go make it happen NOW because it's never too late to be awesome.